A charity Swimalong organised by the Rotary Club of Beckenham has raised more than £2,000 for a children’s charity. The Swimalong took place on Sunday, October 30 at West Wickham Leisure Centre and saw 35 swimmers attempt to complete a marathon swim within three hours. The group narrowly missed out on achieving their goal, with the swimmers achieving a highly credible 37 kilometres (about 87% of a marathon) within the three hour time limit. Despite not being able to achieve the full marathon distance, the swimmers raised more than £2,000 for BBC Children in Need. The event was organised by Rotary Club of Beckenham with the help and support of other clubs and local community organisations. 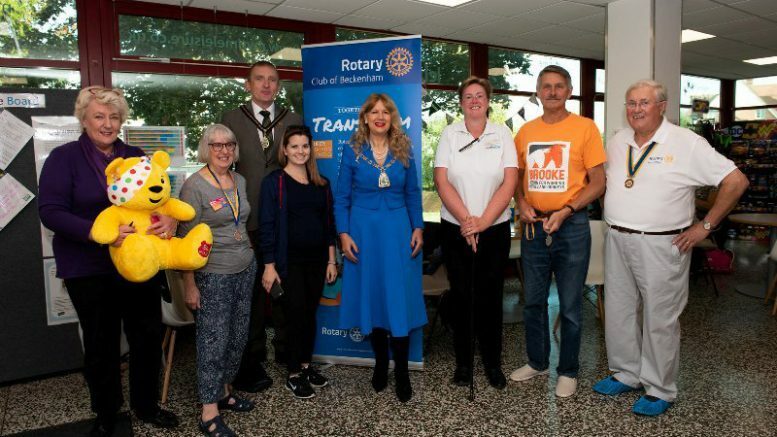 The Mayor of Bromley, councillor Kim Botting, accompanied by her husband, graciously attended and awarded medals to the swimmers and also drew the winning raffle ticket for a giant Pudsey bear. Be the first to comment on "Charity Swimalong raises £2,000 for Children in Need"